2. Download the Supply Diffuser – Perforated – Round Neck – Ceiling Mounted.rfafamily. 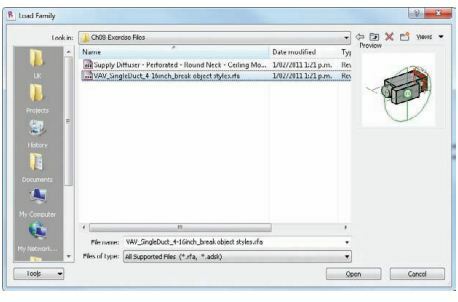 Next choose Insert Load Family, browse to where you have downloaded the family, and click Open (see Figure 9.9). 3. 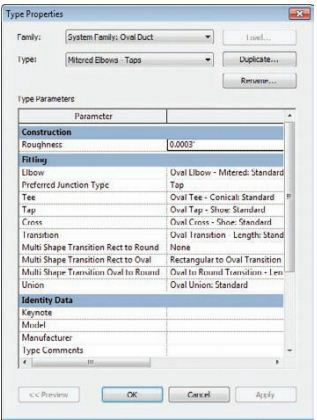 Now download VAV_SingleDuct_4-16inch_break object styles.rfalocated at www .sybex.com/go/masteringrevitmep2012, and insert it into your model (see Figure 9.10). under Modify Place Air Terminal. If you don′t, the diffuser will try to attach to the wall (see Figure 9.11). 5. Once you have placed some diffusers, use the Mechanical Equipment tool on the Home tab to place the downloaded VAV box above the ceiling at an elevation of 10′0″. You can adjust the elevation by changing the elevation offset in the properties (see Figure 9.12). 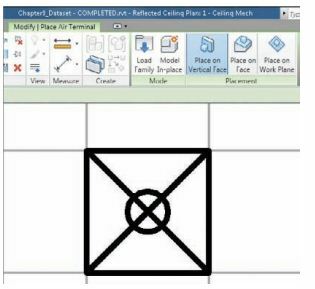 It is important to set the elevation prior to placement if you are in a reflected ceiling plan view, or you may not see the VAV box when it is placed. 6. Now that the VAV box and diffusers are in place, you will want to make them part of a system. 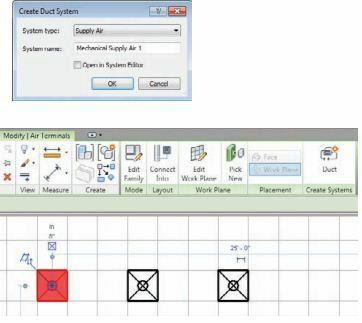 Select a diffuser and click the Duct button on the Create Duct Systems panel of the Modify | Air Terminals contextual tab (see Figure 9.13). This activates a dialog box that allows you to choose the System Type and to assign a name to the system. 7. 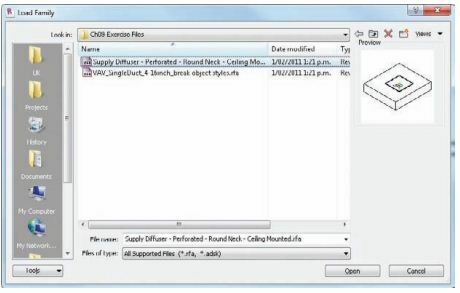 Once you have made the system by clicking OK, the Modify | Duct Systems contextual tab is active on the Ribbon. Click the Edit System button. 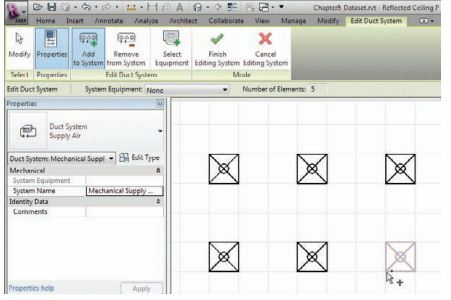 Select Add To System, and select the other air terminals (see Figure 9.14). 8. Now click the Select Equipment button, and select the VAV box to be the equipment for your system. Click the Finish Editing System button to complete the system. 9. 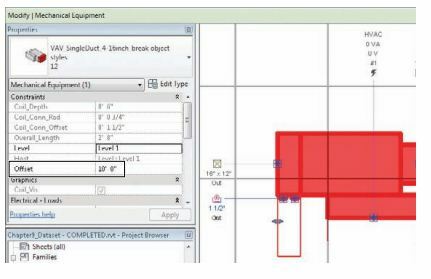 With the system created, select any of the diffusers in the System Browser, as indicated in Figure 9.15. Notice that this selection also selects the appropriate diffuser in the drawing area. 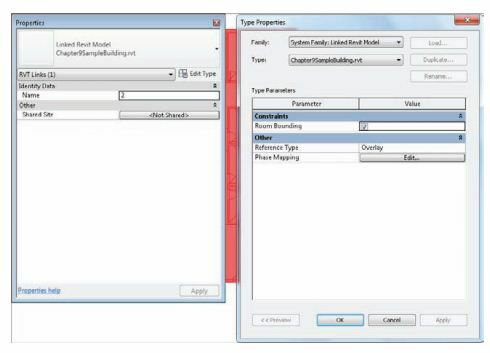 This feature, new to Revit MEP 2012, gives you greater control and manageability of objects.